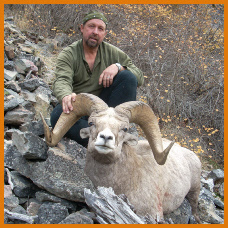 We hunt an area called the Bighorn Crags, along the Middle Fork of the Salmon River, sheep units 27-2 (Hunt #5008), 27-3 (Hunt #5009), 27-L (Hunt #5023), 28-1 (Hunt#5012), and 28-2 (Hunt #5013). 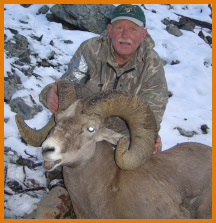 These hunts are very physical but produces excellent rams. We horse pack into base camps and then back-pack into spike camps to access some of the finest sheep country in North America. The sheep tags are issued by a lottery drawing. We can supply you with applications which must be postmarked no later than April 30th. 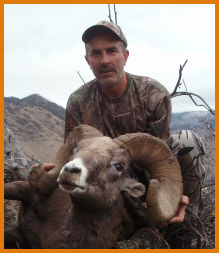 Mountain Goat hunting in Idaho and in the Middle Fork of the Salmon river can be one of the most rewarding hunts you will ever be on. This area contains some of Idaho's top Mountain Goat populations. Trophy billies are common. 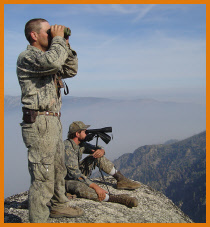 Idaho Fish & Game are opening new areas for the 2007 fall hunting season. These areas have not been hunted for Goats since the 1970's. 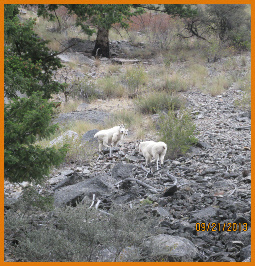 If you want a trophy Mountain Goat do not miss the application period in April. Odd's for Goat are very good. They are around 1 in 7. Season Dates are August 30th thru mid November. $8,100 plus tax.- 1 hunter per 2 guides.